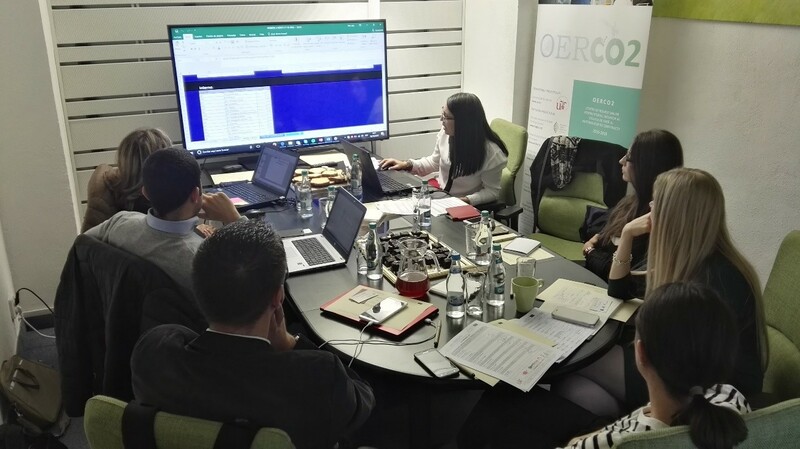 The last October 10th the third meeting of the OERCO2 Project was held at RoGBC´s headquarters in Bucharest (Romania). This project, funded by the ERASMUS+ programme, involves: Universidad de Sevilla (USE), Asociación Empresarial de Investigación Centro Tecnológico del Mármol, Piedra y Materiales (CTM), CertiMaC Soc. Cons, a r. L. (CertiMaC), Centro Tecnológico da Ceramica e do Vidrio (CTCV), Universitatea Transilvania Din Brasov (UTBV), Asociatia Romania Green Building Council (RoGBC). This meeting focused on the presentation of the two main products of the OERCO2 Project: the OER (Open Educational Resource) and the first version of the interactive CO2 Tool for CO2 emissions calculation. In addition, the new tasks and dissemination activities to be carried out by each of the participants of the consortium were organised for the last major event of the project: the international seminar in Seville, which will be held in May 2018.